The weathered gray, custom contemporary house at 28 Treadwell Lane sits on a secluded corner lot of more than two acres. 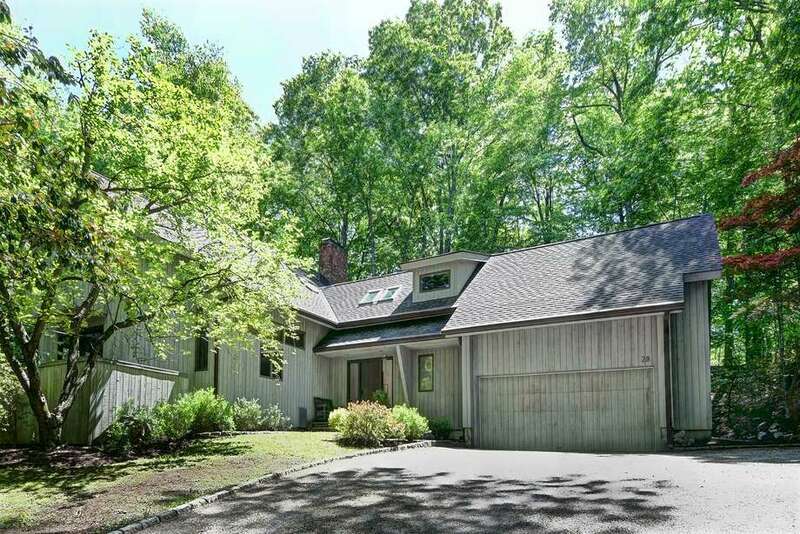 WESTON — Stand among the moss and lichen-covered rock outcroppings of the 2.17-acre level and steeply sloping property at 28 Treadwell Lane in Weston and you’re likely to hear only bird song and the sound of a gentle breeze through the leaves of the many trees on this wooded parcel. So quiet is this private paradise that one could probably hear the rustling of birds’ feathers as they fly overhead. This weathered gray, custom contemporary house and low-maintenance property on a secluded corner lot is the perfect refuge from the hustle and bustle of New York City. It could be a weekend retreat or a year-round residence; a place to recharge one’s batteries and relax entirely. This well-kept architect’s own home, thoughtfully created for his own family, has never been on market. He built it in 1978 incorporating into it special features including a heated greenhouse room with a brick floor and a hidden wet bar in the family room. It also has large windows, an open floor plan, and a generously sized wrap-around composite deck with built-in benches, which can be accessed from the kitchen, dining room and living room. It has 3,657 square feet of living space and 10 rooms on two finished levels and a whole additional level of possibilities in the full unfinished basement. Climb the asphalt and crushed stone driveway lined in Belgium block to the oversized two-car attached garage and the front entrance of this house, which has vertical cedar siding. The front door is framed by wide sidelights. Inside, this intriguing contemporary house has a retro-modern vibe that is difficult for photographs to capture. One must see the house in person to experience that vibe and to see that, despite the number of trees on the property, the house is infused with natural light through its 10-foot tall ceilings, big windows, and numerous skylights beginning right in the spacious entrance foyer. In the sizable living room there is a floor-to-ceiling brick fireplace and sliding doors to the deck that are topped with a long transom. The dining room offers a chance for formal dining or just open the sliders and eat al fresco on the deck. The eat-in kitchen has a ceramic tile floor, two counter areas - one of which is butler’s block, a built-in desk area, and two sets of sliding doors to the deck. There are also two good-size pantry closets; one for food and one for storage or cleaning supplies and equipment. The family room has a floor-to-ceiling brick fireplace and access to the wet bar room with its sink, counter area and cabinetry, and into the greenhouse, which provides a comfortable sitting room among indoor greenery while enjoying the surrounding natural setting outside. A floating staircase in this room leads to the second floor, which contains a reading or lounging nook in the large loft landing and four bedrooms. The large master suite has a cathedral ceiling with exposed beams and sliding doors topped by a transom to a private balcony. Its bath has two separate vanities, a shower, and a soaking tub. Three family bedrooms share a full bath in their own wing. As with the first floor these rooms also enjoy 10-foot ceilings and skylights. On the opposite side of the house, accessed by a separate staircase in the family room is the fifth bedroom, located above the garage. This en suite guest, in-law or au pair room is quite large and could instead be a game, play or recreation room. For more information or to make an appointment to see the house contact Jean Studwell of Higgins Group Bedford Square or Anne Landis of William Raveis Real Estate; Studwell at 203-451-6226 or Jean4Sales@aol.com, and Landis at 203-767-9743 or anne.landis@raveis.com.